#AuntBeeEatsHunstville is a weekly series highlighting some of our favorite spots in Huntsville and Madison, Alabama! If you would like your restaurant to be considered for a review, email me at auntbeesrecipes@gmail.com. Saturday, me and Uncle Bee hit the road for a dinner and movie date! We were so excited to try out the Chocolate Bar Restaurant for the first time. 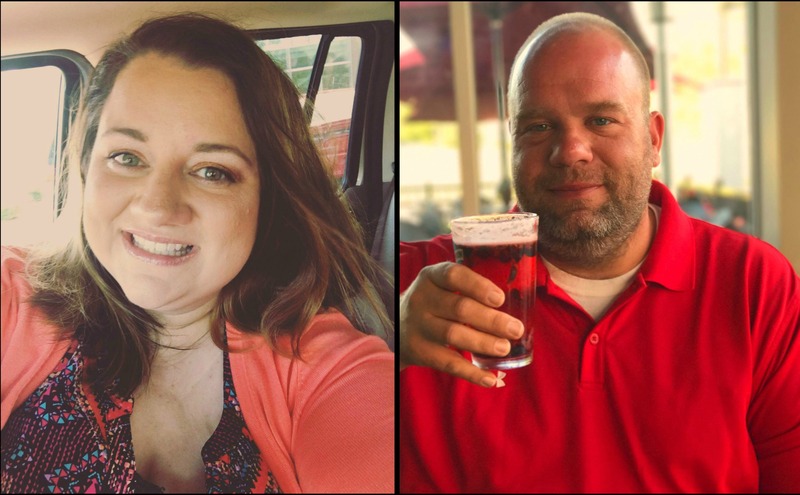 It is actually the first of a new series called #AuntBeeEatsHuntsville where I will be blogging about some of our FANTASTIC local restaurants and sharing our favorites with you! Mikaila is the Front of House manager at the Chocolate Bar and she helped me get everything set up for the review. She was awesome to work with! We chatted via email, text and phone while we were working out the details for our visit and I was so excited to meet her in person. She is an absolute doll! I requested a seat with lots of light for pictures and boy did she deliver! As soon as we walked in, I told Uncle Bee I wanted that many windows in my kitchen. HAHA! I immediately fell in love with modern feel of the restaurant! 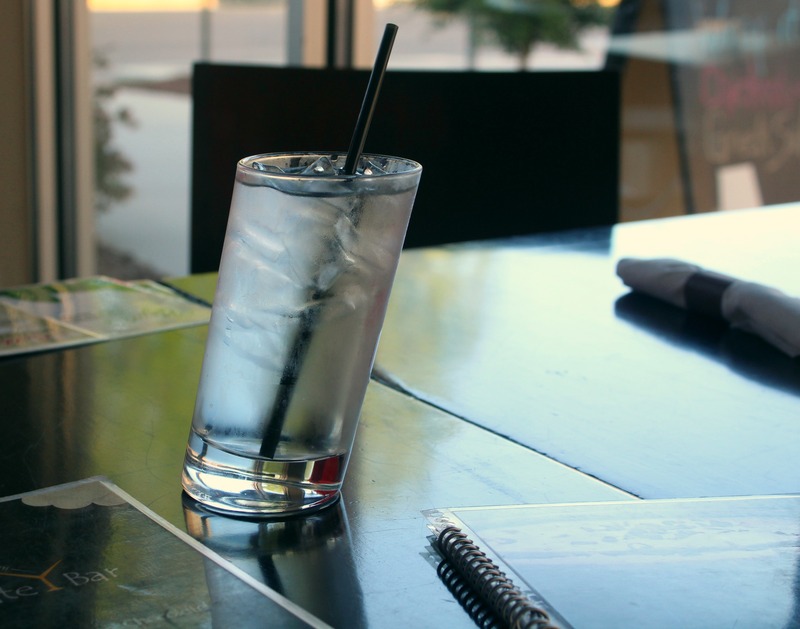 When we sat down, the waitress brought our water glasses and they were slanted! Like leaning water glasses. I had to take a picture because they were just too cute. I was THRILLED with the menu they selected for us! We started with some absolutely INCREDIBLE drinks. I mean INCREDIBLE! Uncle Bee sampled a Beer Cocktail called the Blueberry Flower, which he absolutely LOVED and we shared a Martini Flight. How gorgeous are these drinks? Well I promise they tasted even better than they looked! The Martini Flight flavors were from left to right: Chocolate Salted Caramel, Georgia Peach and Espresso. The Georgia Peach and the Chocolate Salted Caramel were 2 of the best drinks I have ever tried and the Espresso was great too. Next, they brought out our appetizer. I am trying to figure out the right words to explain just how amazing this was. I could make an entire meal out of this Artichoke Spinach Dip. This creamy Parmesan Artichoke dip is served in a warm crock with a bread and vegetable assortment. After 3 bites I was begging them for the recipe, unsuccessfully. Even our sweet waitress (Hi Taylor!) didn’t know the top secret recipe but I can promise you, I am SCOURING the internet for a copycat version as we speak! 😉 Artichoke Spinach Dip is a favorite of my daughters so I am definitely planning on going back and taking her so she can try it! 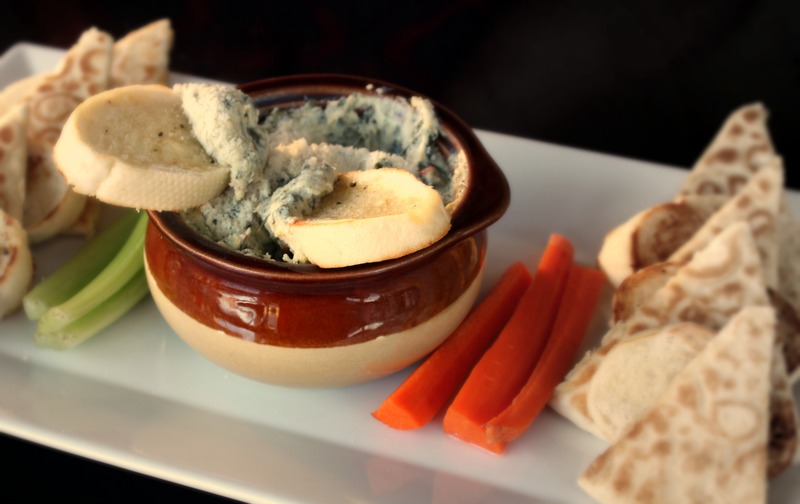 Uncle Bee isn’t even a huge spinach artichoke fan and he DEVOURED this dip! 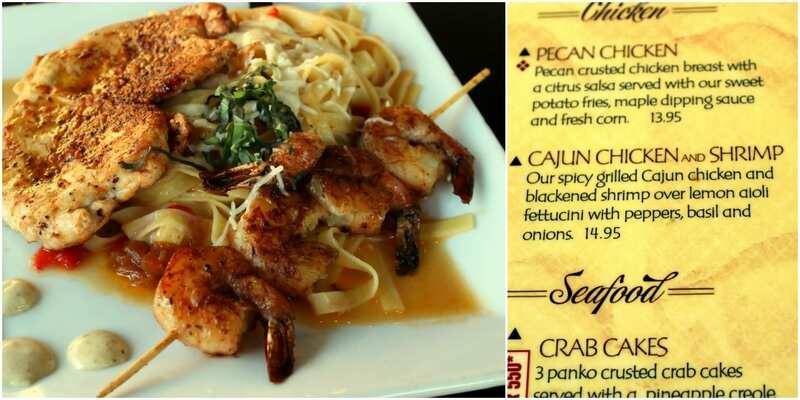 We sampled the Cajun Chicken and Shrimp with Pasta and the Southern Sirloin with Jack Daniels. They were both fantastic. 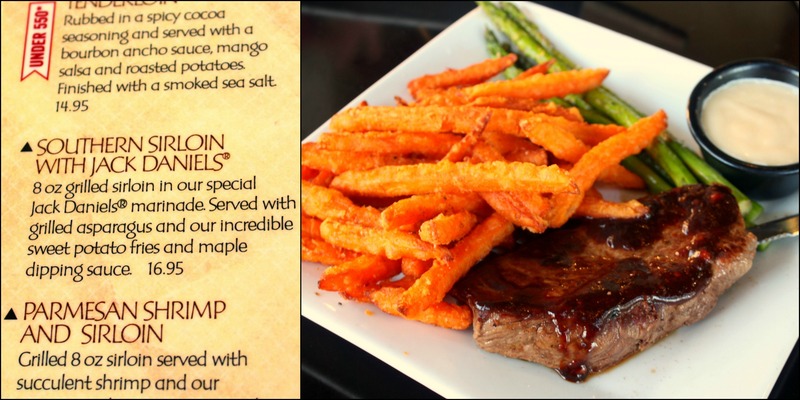 The stars of the show were the sweet potato fries with the maple dipping sauce and that Jack Daniels sauce (OMG!) and of course the steak was cooked perfectly and the shrimp and chicken had amazing flavor as well! I swear I am going to go back just to order the desserts again, HUNGRY, because I want to fully be able to enjoy them. We were stuffed to the brim when these desserts came out. The first one was the Chocolate & Peanut Butter Crepe which was brought out perfectly warm and served with whipped cream and ice cream. I have not stopped thinking about this one since Saturday night. It was amazing and we left way too much of it on the plate. Our second dessert we sampled was the Chocolate Fondue for 2. It was served with a wonderful array of dippers including fresh pineapple, strawberries, marshmallows, bananas with caramelized sugar, pretzel rods, vanilla wafers and oreos. The chocolate fondue is served with a candle lit table-side to keep it warm. I only tried the fondue with the pineapple and marshmallow (my fave), because I was so full but Uncle Bee pushed through and ate a good bit of this one. It was wonderful and so fun! Of the 2 desserts, I gotta say though, that the Chocolate & Peanut Butter Crepe was our favorite! It was one of the best desserts ever! All of the staff we chatted with (Mikaila, Taylor and Victor) were great and made us feel right at home. We will definitely be regulars at the Chocolate Bar! If you have one in your area, I definitely recommend checking it out! Just look at their menu and see for yourself! Sunday, for Father’s Day, we had some more of Uncle Bee’s Favorites: Best Ever Grilled Chicken, Hash-Brown Casserole, Tossed Salad with Buttermilk Ranch Dressing, Grilled Texas Toast and for dessert? We order a Red Velvet Cheesecake Cake from our favorite local bakery: Cakes Like Heaven. It is Uncle Bee’s favorite dessert in the world! We had a terrific weekend! See y’all soon with a couple of new recipes! While I did not receive compensation for this post, The Chocolate Bar did graciously offer to host us as their guests. All opinions are my own. Wow! Those peanut butter crepes! I’m coming to visit you! Amazing mouth watering review! 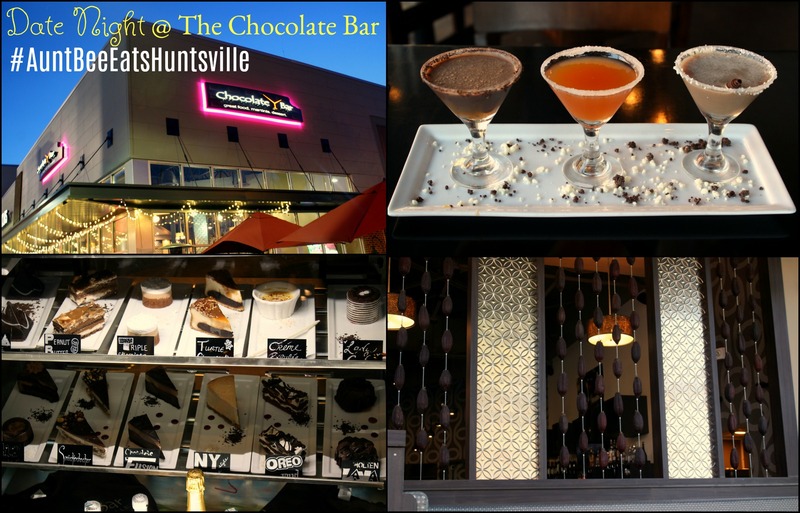 I am going to choose The Chocalate Bar as my next date night! If I hadn’t seen your review and known how honest you are, I would not have known about this place ! Thank you my friend! Looks so good. I can’t wait to try it!! Brandi, thanks for sharing your visit to the Chocolate Bar. We do not have the resturant in Birmingham. The pictures of the food sure made me hungry and your comments and description of the food was right on que. I would love that place. Everything looked delicious and a martini bar? What’s not to love there! WOW! Just look at that lineup! I’ve done that before asking the restaurant to choose our menu and you ALWAYS get the best of the best and boy did you!!! So much deliciousness – fabulous restaurant and review! This place sounds awesome, definitely somewhere my husband and I would enjoy a date night at! Your pics of the food look so good! And where can I get those slanted water glasses?!? Need those!! 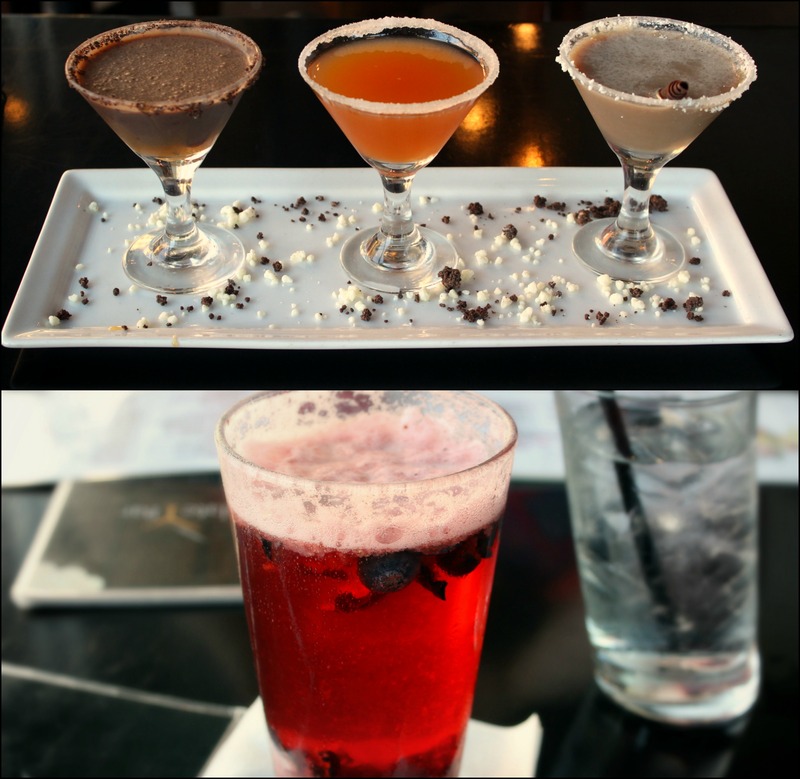 A flight of martinis? A flight?? Sounds so delicious. And those dishes look amazing! Definitely keeping this in the back pocket if we’re ever in Cleveland again. I see there’s one opening in National Harbor! YAY! I cannot get over that menu!! What a perfect place for date night!! You and Uncle Bee are too cute! I am so excited for this new series of yours! This place sounds awesome! I would love to go on a date night to a place like this! Even my husband would absolutely be on board! Oh wow, this place sounds and looks amazing! A great date night for sure! Those desserts looks like heaven!! We have a chocolate bar here in Cleveland. I never been to it but your post makes me want to go this weekend!!! Before you mentioned which dessert was your favorite I was thinking, boy those crepes sound amazing! The whole menu looks so delicious! What a great evening. I love those glasses! 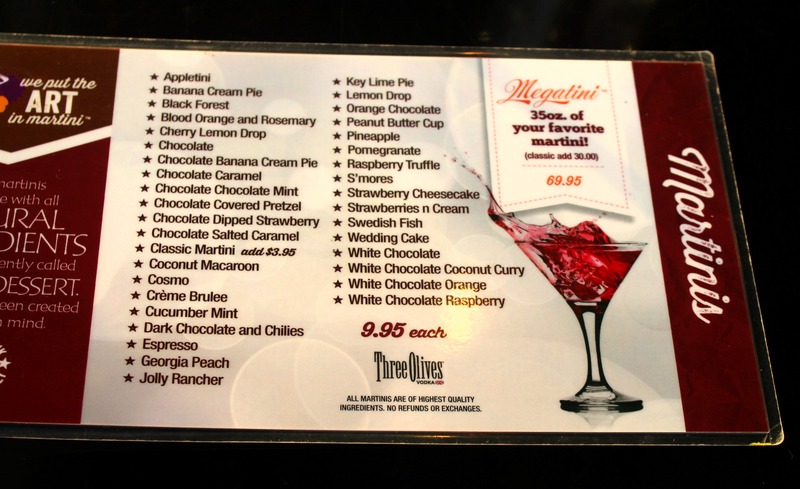 And that martini menu…so many choices! And the food looked amazing too! Sounds like a fabulous date night!